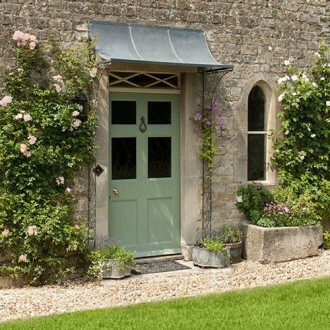 If your house has a glazed fanlight above your door – just like the lovely doorway shown – we can make one of our porches taller to accommodate it. Mr & Mrs Rogers from deepest Somerset (so deep that it was almost Dorset) visited our showroom to see what could be done. They brought with them various images and dimensions of their door so that we could work out the most appropriate design. The result worked beautifully and the porch is now a handsome addition to the front of their generously proportioned farmhouse.